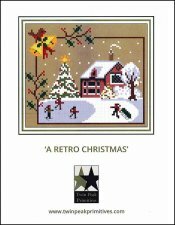 A Retro Christmas [D6660] - $8.00 : Yarn Tree, Your wholesale source for cross stitch supplies. Cross stitch pattern by Twin Peak Primitives. Dressed in their winter gear, kids are skating outside & sledding down the hill. The warm cozy home sits in the background with warm chocolate chip cookies & hot chocolate, for an afternoon snack. With white snow glistening on the branches, a large tree decorated for Christmas stands beside the house. Hello December! Stitch count is 80W x 67H.